​Oct. 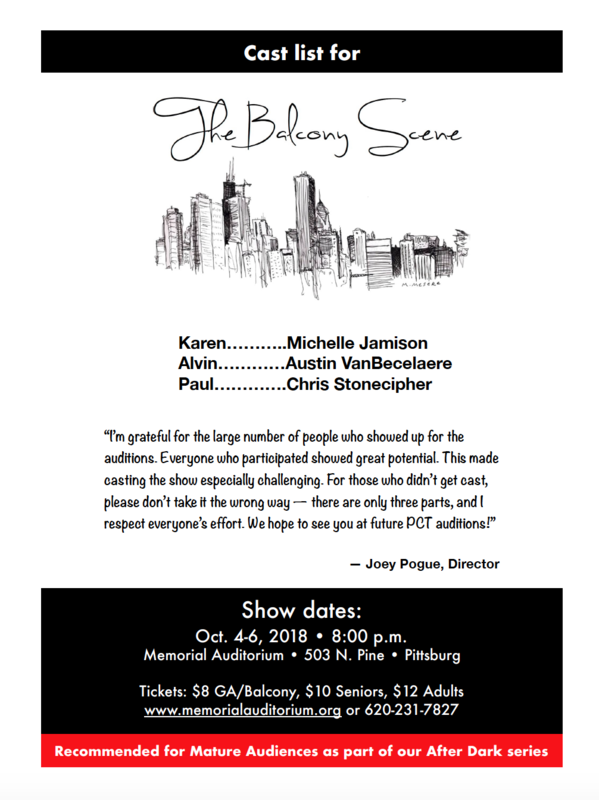 4-6, 2018 • 8:00 p.m.
After the final showing of Pittsburg Community Theatre’s production, “The Balcony Scene,” on Saturday, director Joey Pogue has something out-of-the-ordinary planned: a panel discussion and Q&A with experts from Pittsburg State University and the community. Professor Browyn Conrad, who is president of the PSU Women’s Studies Council, associate professor Harriet Bachner, who is a member of the council, Stephanie Spitz, PSU’s campus victim advocate, and Jim Orwig, local counselor, will comprise the panel. “The theme of the show is relationships and domestic violence, so we’ll open up the floor to a discussion and use this as a teaching tool,” said Pogue, a professor in the Department of Communication who specializes in gender communication. Joey Pogue is a faculty member in the Pittsburg State University Department of Communication, where he teaches mass communication and directs plays for Pitt State Theatre. Recent credits include "Enemy of the People" at PSU, and PCT's "Grapes of Wrath," in which he played "The Preacher."